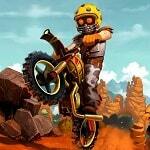 Conquer the most difficult tracks in X-Trial Racing MA and become a real champion. Discover new motorcycles to always ride the current bike. Try to finish all the tracks on the maximum 3 stars.